Various marketing campaign is getting more intense to promote Windows Vista which will be available on retail channel from 30th January 2007, such as contest at showusyourwow.msn.com, Windows Vista giveaway via PowerTogether.com web casts or virtual labs, plenty of print or TV media ads, and free online test drive of Windows Vista. And the Windows Vista consumer launch and viral marketing campaign to create the buzz now comes to a climax with mysterious yet addicting Vanishing Point game jointly organized by Microsoft and AMD, a sweepstakes and also a large-scale online and offline collaborative puzzle game. Vanishing Point is a marketing strategy and a game driven promotional sweepstakes done by 42 Entertainment for Microsoft as part of celebration of Windows Vista consumer launch. The addicting game started when bloggers and the selected who’s who started to receive the extravagant free Acer Ferrari laptops and other desktop computers, mystery wooden box which contains USB drives with Cipher Key, from_Loki.txt and Loki.wmv (shown below), or translucent box with Windows Vista Launch Kit. Gifts are sent by LOKI, One Microsoft Way, Redmond, WA 98052 and in them is a mystery paper note or letter that said the following, with reference to www.vanishingpointgame.com. You are now a decoder. There are only a few like you, but thousands more are looking for you. Find the other decoders before Zero Hour. A spectacular adventure is on the horizon… Can you find it before it disappears? P.S. I’ve hidden something in a puzzle box for you. Find the box, find a way to open it? Beside this initial viral blogging marketing strategy, an initial teaser image was also seen on the Internet Explorer Development Blog, as the image to the right, with words of “Most of you won’t figure this out”, followed by a code of three sets of 20 characters and a web address, enticing you to find out more. All these cipher codes have been decoded, decipher and cracked which are used to view some hidden URL links when Vanishing Point Game counting down to January 8, the official start date for the game. The cipher keys has generated the following codes which will reveal the respective URLs (as since been taken down after the game starts). Vanishing Point Game – Magic Web with Loki talks about disappearing her chemistry professor’s office. The video was released with the completion or solving of box 2 puzzles of the Vanishing Point Games. However, all these are just hype and viral buzz. You can participate in the Vanishing Point Game even if you never receive any of the gifts above. Then how to participate in Vanishing Point Game? Simply register yourself at www.vanishingpointgame.com (contest expired). By registering, you will automatically receive 20 points where each point equals one entry into the Vanishing Point sweepstakes drawing. (If you wish, you may use our email (no longer useful) as your “Referring Party”). 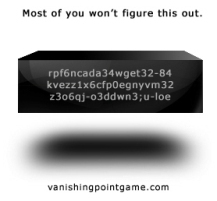 To increase your chance of winning, you can refer your friends or family members to the Vanishing Point Game. If your referral uses your valid registered email as the “Referring Party” during the registration process completed by another sweepstakes participant, you will receive extra additional 10 points for up to 20 referrals for total of 200 points. Note: The Game has ended. Vanishing Point is a puzzle challenge, so of course you will have the opportunity to earn more points and tickets for higher sweepstakes winning chance to win some great prizes by solving the puzzles. Each week, twelve puzzles in a box will be posted along with footage of an unusual real world event taking place all over the globe. You can either show up at the physical location when a countdown hits zero, or check online to view recorded footage of the event for the hints or clues to the puzzles. The first real world event had already taken place at fountains outside Bellagio Hotel and Casino (location made known during a speech Microsoft chairman Bill Gates gave at the CES 2007) on 8th January 2007, as you can see in video below. Loki will appear in more than 10 cities between now and Vista’s Jan. 30 (also contest period) consumer launch date, with stops scheduled in Miami, Phoenix, Berlin, Toronto, Singapore and Seattle. Each puzzle consists of an online element and a real world element which must be combined to arrive at the correct answer. There are 4 boxes available, which new box will open every week starting 8th January 2007. For the 12 puzzles in each box each week, there are 4 “Easy”, “Medium” & “Hard” puzzles each to solve. Each “Easy” puzzle solved will award you 10 points, “Medium” puzzle 20 points, and “Hard” puzzle 50 points, thus making the maximum points you can earned from each box’s puzzles is 320 points, or 1500 points for whole contest promotion period. First box has the theme of “Time passes…”, second “Magic Happens…”, third “Memories fade…”, and forth “People disappear…”. Update: The second events of Vanishing Point have also taken place in several cities across the world at Los Angeles, Phoenix, Miami, and Sydney, Australia (supposedly there was the fifth city of Austin where skywriters wrote and left more clues with messages on the sky for the puzzle quest. The skywritten message can now be viewed at SkyType (link dead). Third events of Vanishing Point is projection images displayed on several building across the world in cities such as San Francisco, Toronto, London, Berlin and Singapore. You can view the projection images at http://vanishingpointgame.com/projections.htm. If the puzzles are too hard for you to crack and solve, there’re helpful users that works round the clock to decipher, decrypt and decode the secrets, problems and enigmas for resolution and solutions. There are various forums and wikis on the web that actively participate in the VanishingPoint Game, which reveal and make known the answers or clues to the puzzles. VanishingPoint Wiki – with all the puzzles solved with answers, solutions, spoilers, how-tos, and timelines. Video clip of the first event of Vanishing Point Game: Loki in Las Vegas at the Bellagio Fountains. More videos of Loki at Las Vegas during CES. Vanishing Point Game – Enigma director or Loki eras, the third video shown after solving the third week puzzle. The final video clip that shown after you completed all 4 puzzle boxes. Vanishing Point Game – Quadruplets – a video for the final part of the meta puzzle and puzzle 4. Vanishing Point Game is a grand mystery puzzles games for players from all over the world, and its prizes are priceless too. Grand Prize winner will be able to visit the ultimate vista vanishing point – the space – in Rocketplane XP Vehicle plus all of the other prizes combined: Windows Vista based AMD powered Dell desktop pc, 24″ widescreen monitor, Zune digital media player, an Xbox 360 gaming console, three Games for Windows game titiles, a Microsoft LifeCam VX-6000, Microsoft Office Ultimate 2007, and $50,000 cash to help defray the cost of taxes. Other prizes include 15 loaded AMD based computers with Windows Vista Ultimate, selection of Zune, Xbox 360, Microsoft Lifecam VX-6000, Microsoft Office Ultimate 2007, 24″/30″ widescreen LCD monitor, and games. There are also 75 device prizes of Windows Vista Ultimate, and one of the Xbox 360, Zune, or iRiver Clix, 150 software prizes of Windows Vista Ultimate or Office Ultimate 2007, and 250 games prizes of three Games for Windows game titles. You must be 18 and older to play Vanishing Point Game, and the game is only opened for residents from Australia, Canada (except the Province of Quebec), Germany, Singapore, United Kingdom, New Zealand, Ireland, France, Italy, Spain and the United States and District of Columbia. Vanishing Point Game and Sweepstakes runs from 7:00 a.m. Pacific Time on January 8, 2007 and ends at 9:00 p.m. Pacific Time on January 30, 2007. If you’re late, don’t worry, you can still open and solve the previous boxes’ puzzles. Note: The identity of Loki is Minae Noji, however the answer to meta puzzle is Lorelei, Odessa, Kara, Ivy.